Our Classic Tables are a collection of narrow tables perfect for your narrow end table, hall table, entry table or narrow console table. 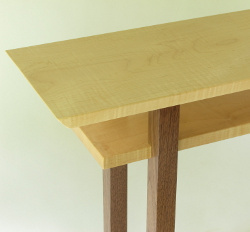 The inset shelf is hand-cut into the legs for an interesting joinery detail. The shelf is the perfect place to tuck away the mail, your keys, the remotes, a good book, or a cell phone. The narrow table size adds style to your space without taking it over. Available in 5 different wood selections and a range of sizes from end table to console table, this mid century modern furniture design will add just the right functionality to that hard-to-fit space. 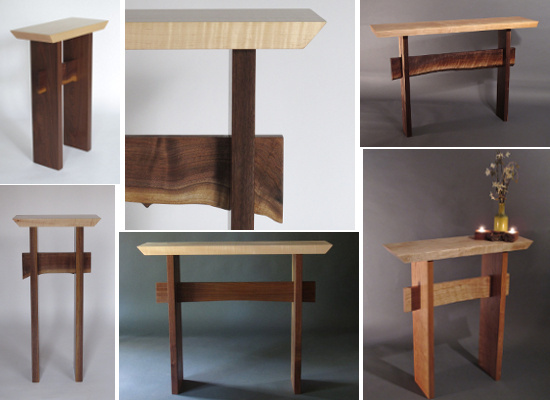 Ordering your custom Classic table is as easy as 1 - 2 - 3! 2. Select your wood color/combination. You can select solid Walnut, Cherry or Tiger Maple or choose one of our popular combinations such as Tiger Maple with Walnut or Tiger Maple with Cherry. When selecting a combination, the table top and shelf will be created from Tiger Maple (the light blonde colored wood) and the legs/feet will be made from the contrasting wood.